Guys! I am bursting at the seams because I have some super exciting news to share today! I am about to head to Chicago to attend this year’s Blogher Food conference! Canadian Lentils is sponsoring me and I couldn’t be more excited! I have always wanted to go to a food only conference, because cooking is something that I have a passion for and want to keep improving at! I am going to take feverish notes about how to hone my skills and then come back home and implement them all for you guys! Oh, and if you are going to BlogHer Food 15 too make sure to find me at the special dinner event Canadian Lentils is hosting Thursday night, November 5th, I love new friends! Whew. So enough about me! How about a delicious recipe? We have been trying hard to be healthier around these parts. After several months of working towards our goals I am realizing that what works best for our family (especially the little ones) is incorporating more healthy foods into meals we already like. I am becoming a wizard at sneaking fruits and veggies into things, haha! Seriously though, little choices in the kitchen add up, and if you are consistently striving to add more fiber instead of more fat, your body will feel the difference! I know mine has. 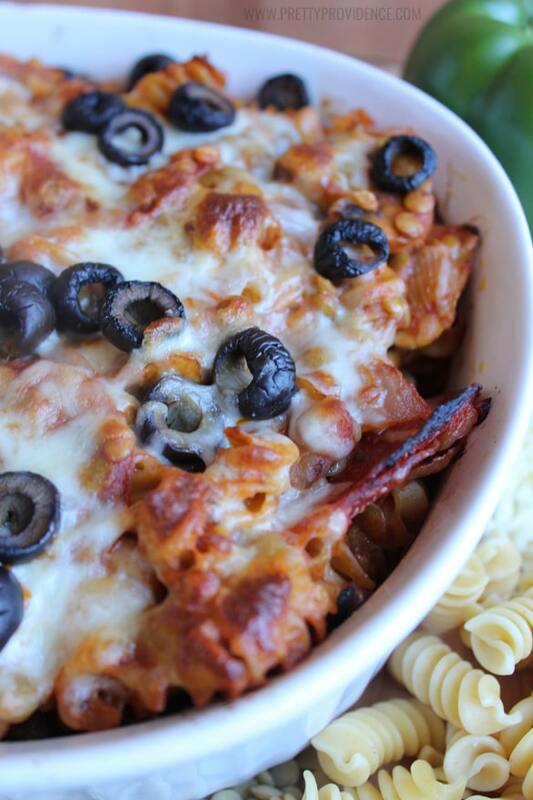 Dinner time can be a struggle since it is such a busy time of day, so who doesn’t love a make ahead casserole? 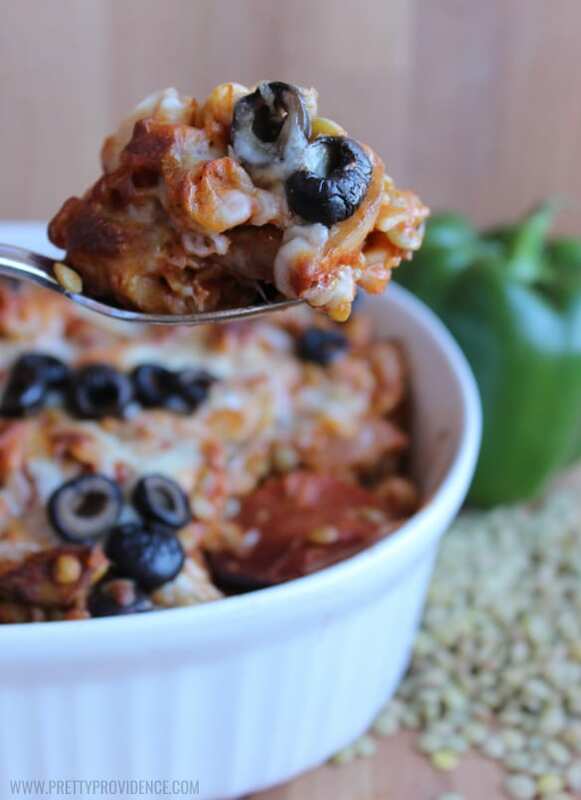 This rotini lentil pizza bake tastes amazing and is packed with healthy foods! You ready for the recipe? Cook pasta until al dente, drain and reserve in a large bowl. Heat your canola oil in a large sauté pan, add pepperoni and brown on both sides. Remove pepperoni with a slotted spoon and toss with cooked pasta, leaving some of the oil in the sauté pan behind. Add onions and garlic and cook until slightly golden. Add mushrooms and green peppers and cook for 2-3 minutes. Stir in tomato sauce, paste, cooked lentils, oregano, basil, and red pepper flakes. Season with salt and black pepper and stir into cooked pasta mixture. 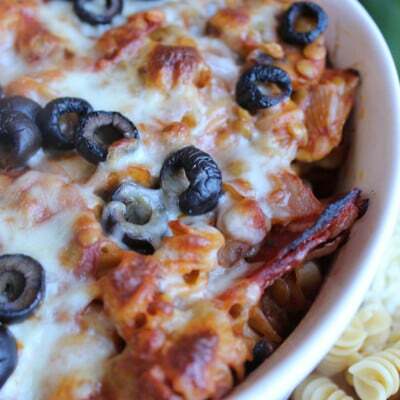 Add one cup of your grated cheese to the pasta mixture and stir. 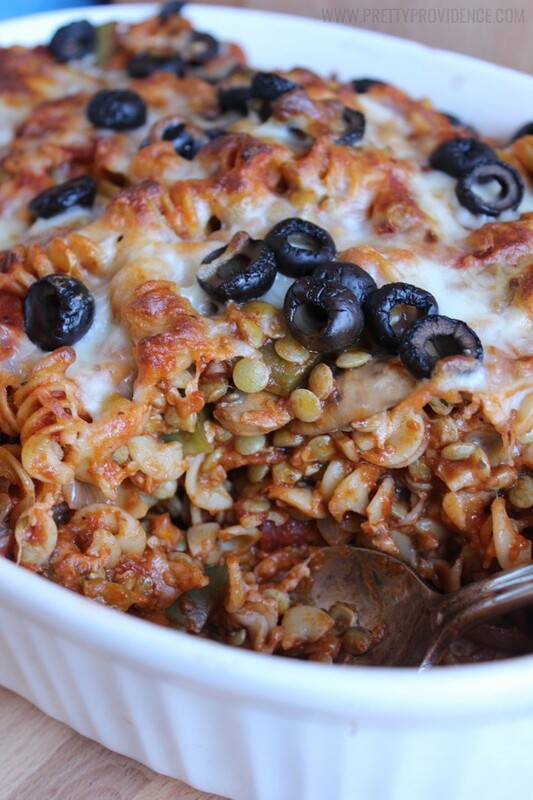 Pour into a 9x14 pan and sprinkle olives and remaining cheese over top. Bake uncovered for 20 minutes or until bubbly and lightly golden on top. If needed, use the broiler to brown an additional 5 minutes.